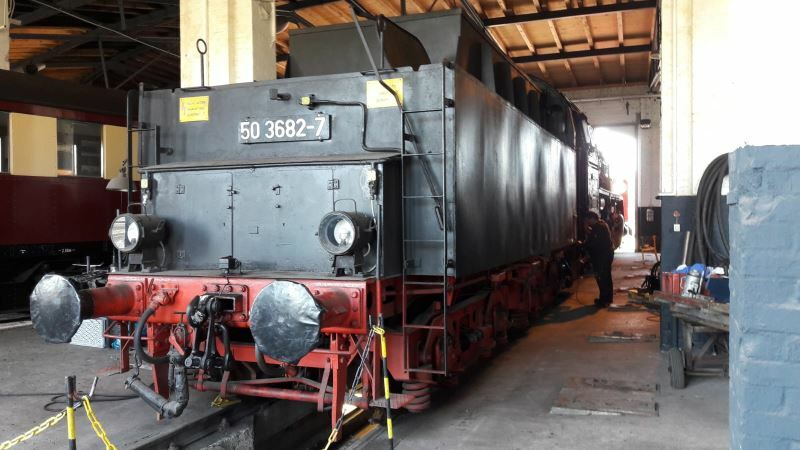 As regular readers of our newsletter will already know, we are currently in the middle of a general overhaul on our steam loco 50 3570. To obtain the official permit ("ticket") following the overhaul, all parts of the engine must be in perfect working order. Since there is still work outstanding on the locomotive's tender - that is, the truck attached which carries its coal and water - the tender has been exchanged with that from 50 3682-7, which still has a valid ticket. This change of tenders will help to speed up the return of 50 3570 to traffic. Unfortunately, it's not just a matter of unhooking a tender from one locomotive and coupling it to another. Engine and tender are attached by three steel bars, each the diameter of a man's arm, while the middle of these three bars is pressed against the engine with a force of several tons by a huge spring located within the tender frames. This spring tension can only be overcome by using hydraulic assistance. The hydraulic equipment is seen in front of the engine in the next picture. After splitting the locomotives and tenders, each engine was attached to the other one's tender. 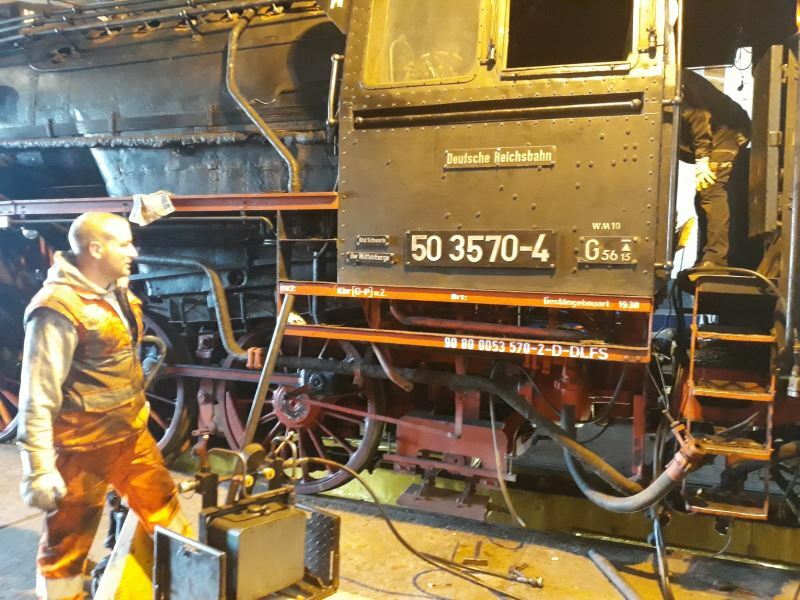 Many regular visitors to our museum and our website will be well aware that we have to do maintenance work on our loco 50 3570 in order to keep her fit to steam in the future. A major part of this work has been to free the inside of the boiler from lime-scale (boiler furring). To do this, all the wash-out plugs had to be removed and the boiler thoroughly cleaned. Those same 30 or so washout plugs then had to be reconditioned and replaced. Two of our members busied themselves with the refettling of the plugs today and other members screwed them back into place in the boiler. There were also other jobs to be carried out on the brakes and the running gear. All the brake blocks were changed and the pneumatic control valves in the braking system were removed for reconditioning. Work was also carried out on the axle bearings to ensure that the locomotive runs smoothly. That is really dirty work, but what the heck - at least it's worth taking a shower afterwards! Over the course of the last week, a vegetation check has been undertaken on the running lines in the museum, to prevent an uncontrolled spread of plant life on the tracks. Most of our active members are currently working on locos which must be prepared for the forthcoming season. At he moment, we are concentrating on the necessary brake inspections. On diesellok 102 172 and steam loco 50 3570, the air reservoirs are being replaced - these are the tanks which store the compressed air necessary for the brakes to operate. Such pressure containers have a limited service life and have to be replaced from time to time. On the steam loco, the brake blocks are currently being changed. A little bit of advertising on our own account is allowed: on the rear façade of the loco shed, there is a huge banner we have put up, designed to make passing railway passengers curious about the museum. Our cafeteria area has recently been enhanced by the appearance of a new exhibit. This illuminated sign stood in Rheine depot until the end of the 1970s and was there to remind staff that behind the sign there was an ash-pit. This was a big pit in which hot ashes from steam engines, that is wet ash and cinders, were doused with water and stored until taken away. 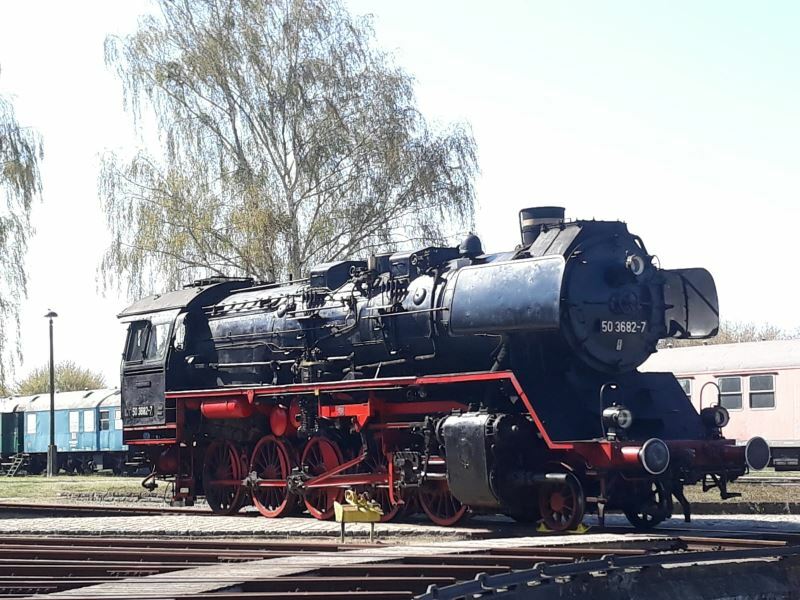 28.03.2019: Start of the new season in the "Historic Locoshed"
In just a few days, the "Historische Lokschuppen Wittenberge" opens its shed doors to welcome visitors once again. On Saturday, April 6, 2019, the winter break is over. 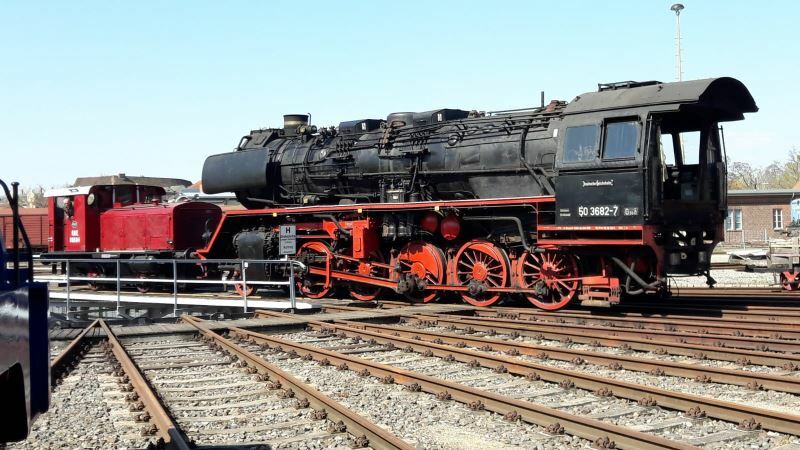 From then, the museum, located on the land formerly occupied by the Wittenberge running shed (Bw) until October 19, 2019 is open every Saturday from 10 am to 5 pm (last admission at 4 pm) for all rail enthusiasts, large and small alike. Die highlights of this year's season are the steaming days on May 4 and 5, July 6 and 7 and on October 12 and 13, when the impressive steel giants awaken from their slumbers. In addition, the "Historische Lokschuppen Wittenberge" is also open on Heritage Open Day, September 8, 2019. Wittenberge depot, with over 1,000 staff and up to 150 locomotives allocated to it, was once one of the ten largest operations depots on the German State Railways.It wasn't until spring 1987 that there were no longer any steam locomotines in service at Wittenberge depot. Ten years later, the loco-shed doors closed. But after fifteen year's slumber, the miracle occurred and steam and diesel locomotives moved back into the former Wittenberge depot. 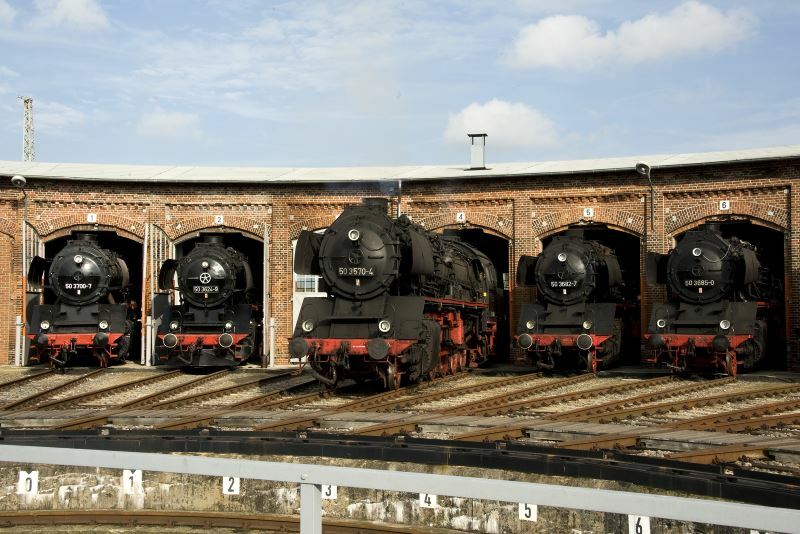 Today, the "Historische Lokschuppen Wittenberge" is the largest railway museum in the federal state of Brandenburg. 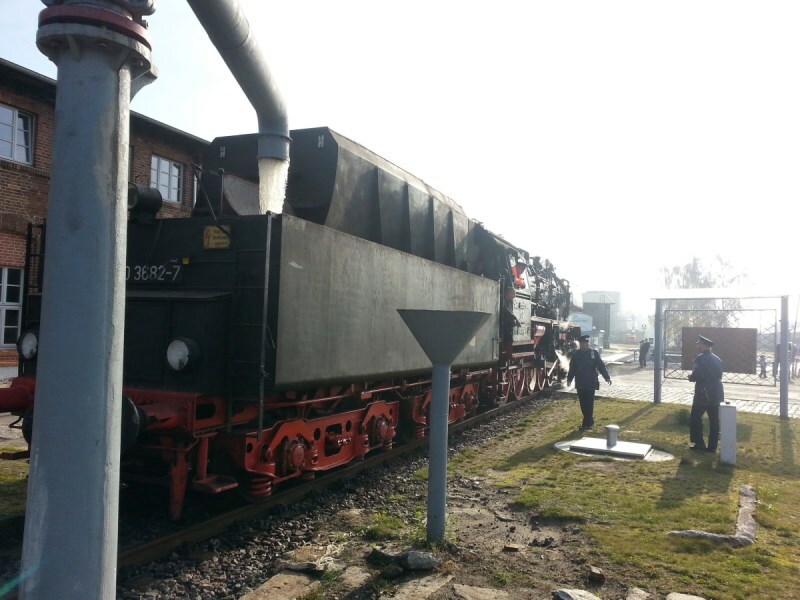 With seven steam locomotives altogether, exhibits included several historical diesel locos, an electric loco, motorised engineer's trolleys and pump cars, a hospital train of the former DR and the car-carrier of the first DDR presidential train. First a few words on progress of restoring railcar trailer VB 197 805: the passenger accommodation was completely stripped out some time ago. Now begins the work of refitting the interior furnishings. The reusable parts are inspected and then reconditioned for re-installation. Some of the switch cabinets have already been fettled up by members. On 15.3.2019, we were advised by the State's railway inspectorate that in principle, they would be prepared to consider re-certifiction of the vehicle for museum use. Admittedly, before that can happen, the situation regarding the vehicle documentation must be clarified, which may present some few problems. However, the fact that it is a possibility - and indeed one which we intend to bring about - the further work of restoration will be planned with this in mind. 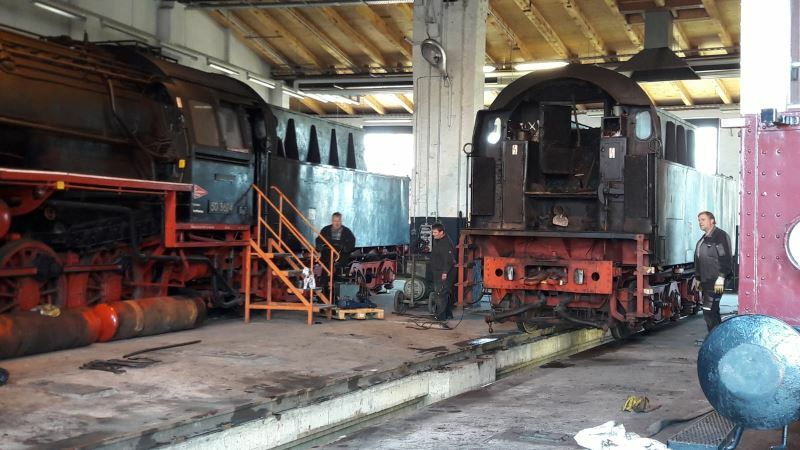 On 16.3.2019, restoration of the loco's braking system was completed. All components are back where they belong, although they have been cleaned and repainted and some of them have been replaced by new parts. 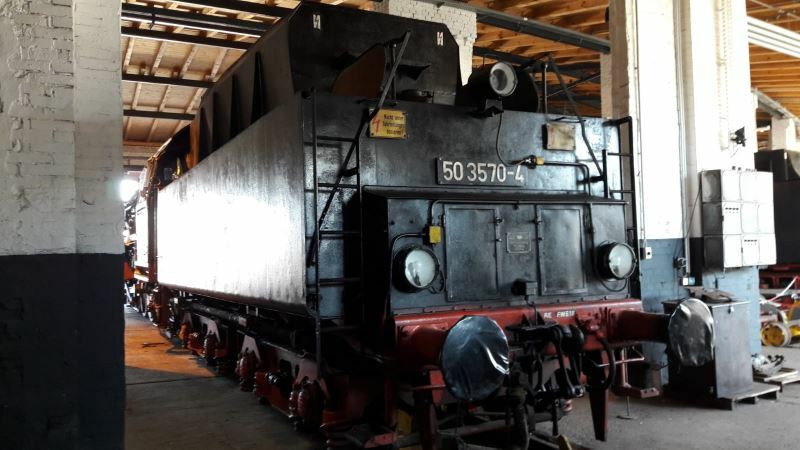 The loco is scheduled for test running on the museum's tracks on 6.4.2019 - that is the museum's opening day of the 2019 season. Do come along and experience with us the first movements of the loco since its overhaul! We are delighted to have been able to finish work on the tracks at the water tower and the sanding facility before the start of the season. Sleepers have been replaced over around 100 metres of track and the spent ballast replaced by cleaned ballast. Work on the track in the locoshed itself is also making good progress. In the meantime, sleepers and rails have been laid. Now the more important jobs still remaining are concreting the space between the rails and those between the outside of the rails and the existing floor.